His epitaph could well have been devoted to the “blind saxophone player” when, on the late 50s TV sensation Oh Boy, he was in the line-up of Lord Rockingham’s Eleven playing slightly out of tune on the hit Hoots Mon. Fortunately polymath Benny Green would become far better known as a broadcaster and writer with interests in music, theatre, cinema, literature and cricket. 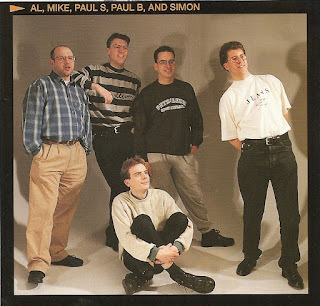 In fact those dark sunglasses had been an attempt to avoid being recognised in “this appalling travesty of a band” but it didn’t stop the fan mail pouring in at the time. Despite being most people’s idea of a Cockney, Benny was born in his mother’s home town of Leeds in December 1927 to Dave (“a strolling player”) and Fanny. Though married in London they had met the year before when his saxophone-playing father had been touring Northern England. Following demob in 1947 Benny plied his trade as a touring professional sax player working the rounds at Jewish weddings, tea-dances, holiday camps and with a variety outfits led by Anton Burns, Sonny Landau, Roy Fox, Lew Stone, Bertie King, Kenny Baker, Tito Burns, Geoff Love and Ralph Sharon. Life changed in two respects in 1952 when he joined Ronnie Scott’s band – he would become life-long friends with Scott – and he wrote the first of his regular columns for the New Musical Express. Eventually his interest in writing about jazz rather than playing it led to him becoming jazz correspondent of the Observer in 1958. 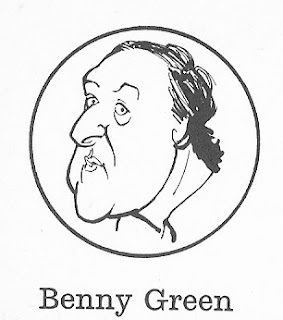 By the early 1960s Benny was now well-known as a broadcaster and writer. His first radio broadcast had been in 1955, though as musician rather than as host. However, the BBC were looking for musicians who could present a growing number of jazz programmes with authority and interest, Benny was one of them, alongside the likes of Humphrey Lyttelton, George Melly, Steve Race and Ken Sykora. 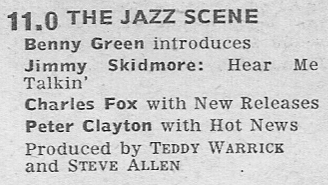 As early as 1961 he was an occasional host on Network Three’s Jazz Session and in 1964 a regular on the Light Programme with The Jazz Scene and It’s Jazz. 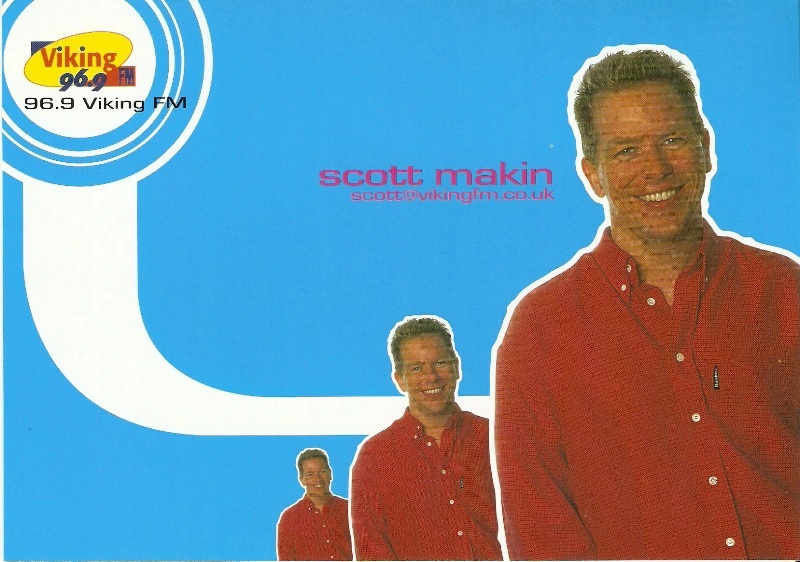 Later he was a contributor to Jazz on One in the early days of Radio 1 when its fare extended beyond pop. 1964 also saw the start of his regular TV work as either presenter or scriptwriter with Rediffusion’s thrice-weekly Three After Six, billed as “a personal comment on what’s going on”. A TV Times article in November 1964 told readers that “In theory it sounds easy - just assemble three intelligent people who take an interest in what’s going on in the world, sit them in front of the cameras and let them chat to each other for 20 minutes. No scripts to be written and learned, no elaborate rehearsals. The trio have to like each other enough to enjoy discussion, yet have such different personalities that they are constantly disagreeing. It’s generally agreed that the current team of Dee Wells, Alan Brien and Benny Green disagree with rare pungency and wit”. A couple of years he was the host of a late-night chat show, again for Rediffusion three nights a week, Late Show London. Writing in The Spectator Stuart Hood described it as “probably the worst programme to go on the telly in living memory”. How fair this was I don’t know, to my knowledge recordings of the series, which went out live, don’t exist. 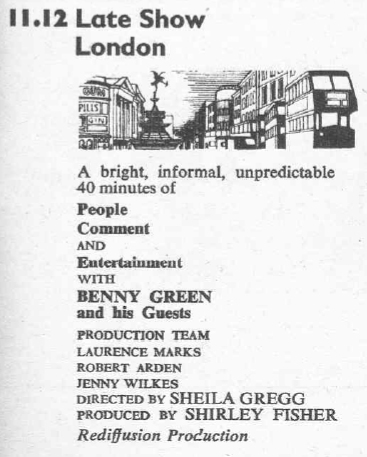 But at least some viewers approved:“There could be no better choice of host than Benny Green who treats his guests in just the right way” wrote a Mrs Gleneen Proudman. Alongside his jazz broadcasting on both TV (Jazz at the Maltings, Commonwealth Jazz Club) and radio he was also a literary critic for The Spectator and provided film review for Punch. In 1975 he scripted two programmes for Radio 2 that reflected his different interests. From the world of music came a 13-part tribute in The Fred Astaire Story with David Niven recording the narration. One of Green’s literary heroes was P.G. Wodehouse and in Wodehouse on Broadway, presented by Ian Carmichael, he wrote about his time as lyricist and librettist in musical theatre. In 1976 Radio 2 broadcast two major series written by Green: first was the 26-part celebration of “outstanding producers of entertainment in the USA this century”, The American Showmen narrated by Michael Craig. Secondly, his love of the cinema, and especially the movie musicals led to him research and interview most of the main protagonists for the 28-part Hooray for Hollywood. Narrated by Douglas Fairbanks Junior it traced the development of the genre from the 1930s Busby Berkley extravaganzas until they went out of fashion in the late 60s. 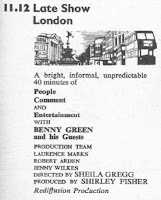 Here’s the final episode Full Circle, first transmitted on 19 December 1976 and here repeated on 6 January 1981. Benny’s radio repertoire was still expanding. On Radio 4 he appeared on the Robert Robinson hosted talking shop Stop the Week and here on Start the Week in July 1980 he got to interview one of his idols Ella Fitzgerald. In 1978 he had a six month stint on Radio 2’s Album Time (he’d go on to present a similar series on the BBC’s World Service). 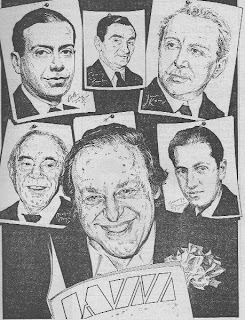 The following year there was a major series on the great American songwriters Green On…, each week focusing on the likes of Kern, Porter or Gershwin. 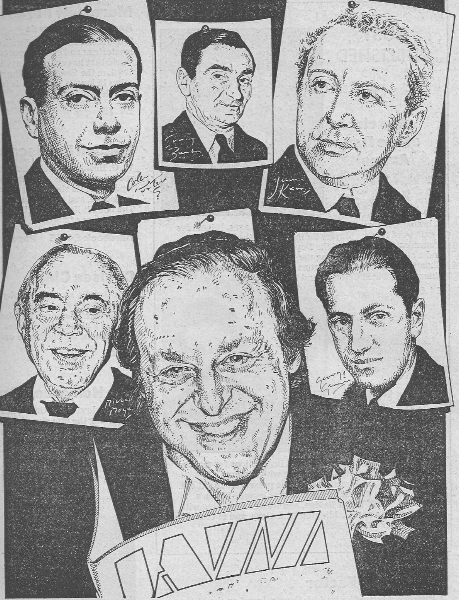 Benny then took over a Sunday morning show for a few months (September 1979 to January 1980) for what was, in effect, a dry run for his most famous series. In 1980 he co-wrote a series on the career of Stanley Holloway, Wiv a Little Bit o’ Luck and on 30 March kicked off his Sunday afternoon shows that would become unofficially be known as The Art of the Songwriter. “He was to carry on working for the Beeb right up to the end; in his bag when we took him to hospital for the last time was a script for the next Sunday’s Art of the Songwriter show. When in an act of Eighties philistinism, a new station controller attempted to displace him for his Radio 2 slot, his two million listeners were outraged, there were complaints in the press, and a protest march up Regent Street. Chastened, the controller renewed Benny’s contract, and the show continued. Taken collectively, his Sunday show is perhaps the largest single collection of history, anecdote and analysis of the popular song. For reasons so asinine that they are best left unexamined, the BBC did not have a policy of keeping archive copies of the shows. When we decided to collect them together and present copies to the National Sound Archive for the study and pleasure of future generations, we had to obtain cassettes from fans who had illegally taped the show every week”. A number of the shows were unearthed as part of last year’s Listeners’ Archive project. Here’s my own contribution with an early example from 14 December 1980. 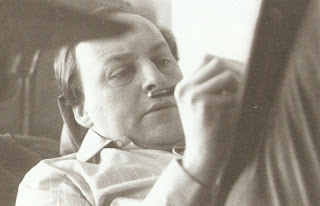 Green’s jazz roots were not forgotten, however, as he also chaired Jazz Score (1981-1997). Ostensibly a music quiz it effectively allowed a load of jazzers to reminisce and entertain the audience with their anecdotes. I’ll post an edition of Jazz Score at some future date. 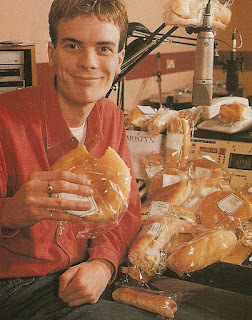 In 1990 Benny was part of the launch line-up for London’s Jazz FM with a Tuesday night series on songs and songwriters. Benny’s last Radio 2 Sunday show was in June 1998, they were usually recorded in pairs on Friday, and he died a little over a week later. Those programmes are remembered on Radio 2 tonight in Green on Green when his son Leo recalls Benny’s career and favourite music. Next week Leo will re-create that last un-broadcast show based on that script that was in Benny’s bag. 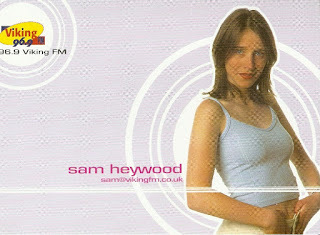 To conclude this series of posts on Viking Radio here are a few random bits of publicity some audio memories from the late 90s and early 00s. 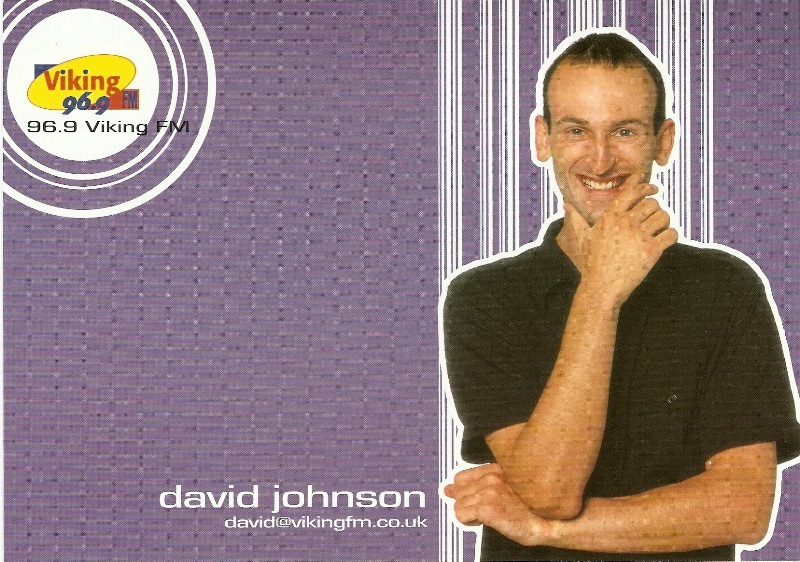 From the mid 90s some team publicity shots with the DJs posing in their Petroleum clothing. The breakfast star from late 1993 was king of the wind-ups Simon Logan. Readers of a Viking FM publicity leaflet were told that Simon is “out of bed at 4.30 each morning to feed his cat Mostyn”. 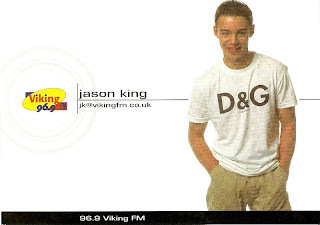 This is part of Simon’s last show at Viking FM (before his move to Radio Aire) on 19 December 1997. Simon currently broadcasts daily on BBC Radio Newcastle. Her birthday is 18 February. Sam’s favourite bands are Alanis Morissette and Sash and she thinks the sexiest person is Matthew Perry – Chandler from Friends. (After 13 years at Viking Sam is now on KCFM as Programme Manager). His birthday is 31 May. 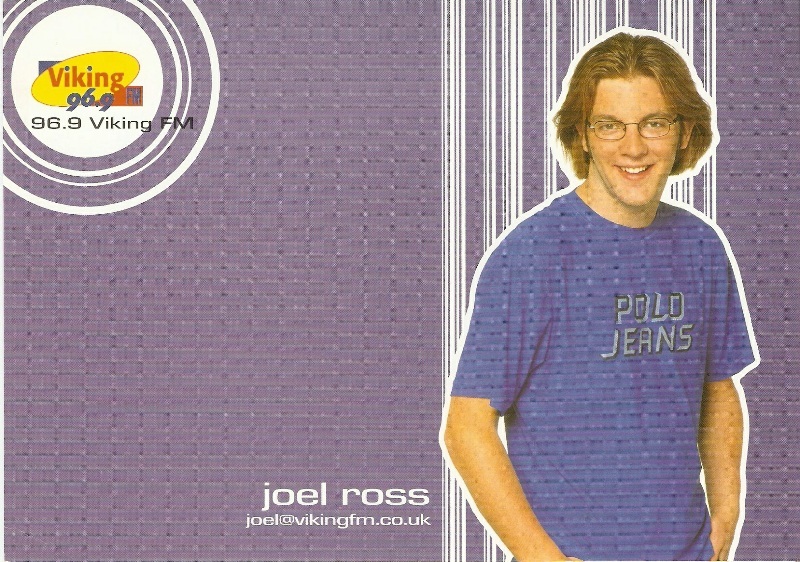 His favourite band is The Spice Girls and his favourite TV show is Prisoner Cell Block H. (Joel along with JK teamed up for the Viking breakfast show. 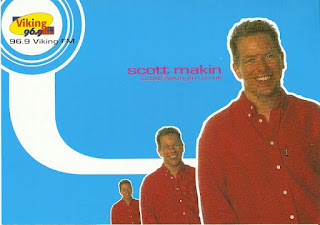 Their subsequent career on radio and TV is well documented). Born on 6 January. Thinks the sexiest person is Claire Goose. Loves to eat curry, pizza and boiled egg and soldiers. His favourite experience at the station was doing the “full monty” in front of 2000 women. 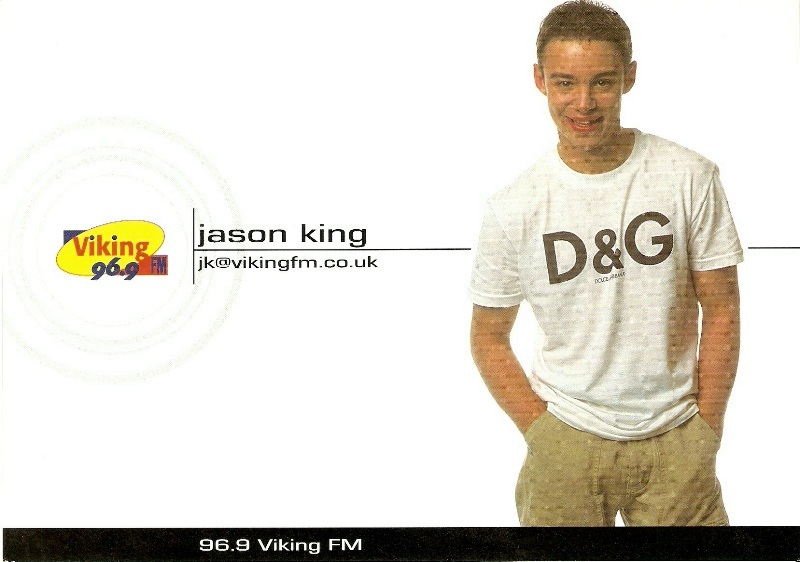 When JK and Joel left Viking it was Simon Hirst that took over the breakfast slot. 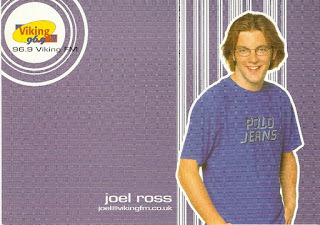 From Aircheckdownloads.com here’s Hirsty in June 2002. From 2000 Viking’s new logo using EMAP’s ‘Big City’ branding. Another clip from Aircheckdownloads.com, this time Steve Jordan who returned to Viking last year having originally been on air at the station between 1995 and 1999. It’s forty years ago today that the first Radio 1 Roadshow trundled off round the coast of Britain, offering a chance to see your favourite DJs and bands you may just have heard of. And for radio anoraks like me an opportunity to poke around the back of the trucks and see how the show was put on-air. Here’s part of a show from Skegness in the summer of 1990 with DJ Phillip Schofield recovering from the Noel Edmonds Gotcha escapades in Cleethorpes the previous day. As usual with these events one suspects the crowd in Skeggy got more enjoyment out of it than the radio audience. This is the Gotcha footage. 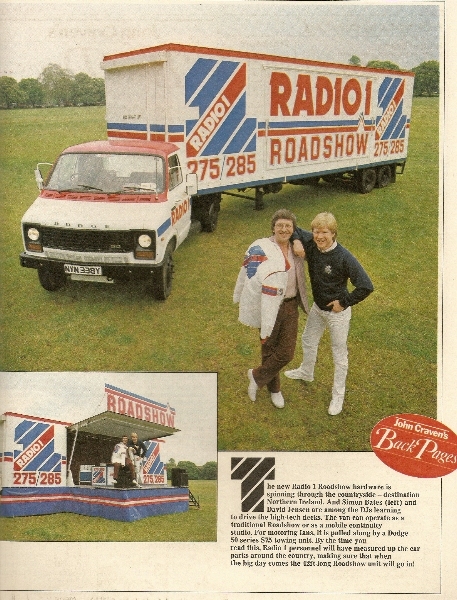 Simon Bates and Kid Jensen with the new Roadshow truck in 1983.